In the first decade of the 21st century, camera manufacturers had to find ways to differentiate themselves from the competition. Kodak brought Wi-Fi to the camera world with its EasyShare One, Panasonic released the DMC-LX1 that had a 16:9 sensor and Samsung put selfie mirrors on the front of its compacts. Not to be outdone, Sony released its Cyber-shot DSC-N1 in October 2005, which was a compact camera and a 500-shot photo album in one. On the front panel, the N1 had an 8.1MP, 1/1.8" CCD with a top ISO of 800, a 38-114mm equivalent lens, 5-area AF system and a battery that lasted for roughly 300 shots (which is quite respectable). Images and VGA video could be saved to internal memory or a Memory Stick Pro Duo slot. Photo quality was typical for 2005, which is to say, good until about ISO 400 or so. The real action takes place on the back of the DSC-N1, where you'll find a 3", 230k-dot RGBW LCD. The display was touch-enabled and offered features that we take for granted today, like touch AF, menu operation and image playback. Enough beating around the bush: here's what made the DSC-N1 unique. 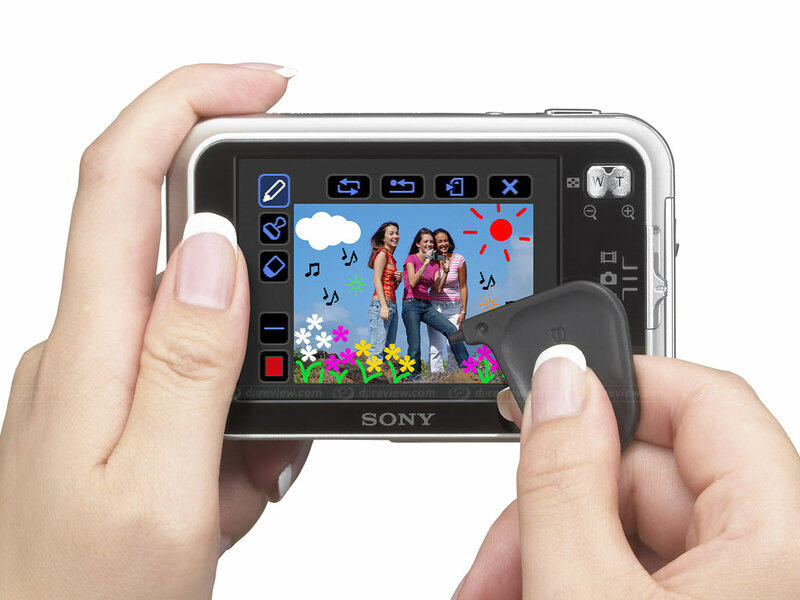 Every time you took a photo, a VGA-sized version would be saved to the camera's internal memory bank. Album photos are saved 'first in first out', which means that older photos will be automatically deleted from the album if you don't protect or copy them first. Images were organized by date and time and you could view slideshows of images from that date or the whole album. Slideshows were accompanied by fancy transitions and generic background music. One nice thing was that you could replace the built-in music with your own, drawing from CDs or MP3s. As the photo above says, you could 'paint' on top of a photo using an included stylus. You could pick a color and a line size and draw away or add 'stamps'. Thankfully, an eraser was also available. Sony offered an optional dock, known as the Cyber-shot Station, which let you charge the battery or display your slideshows on a TV. 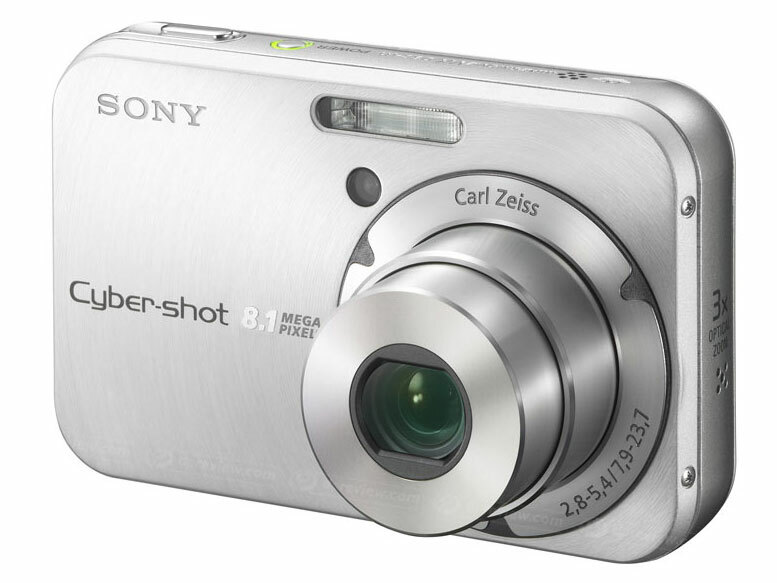 Did you have a Cyber-shot DSC-N1 or the DSC-N2 that followed it? Share your memories in the comments! As always, suggestions for future tbt's are appreciated. I never had the N1/2. But I did have the T7 and still own it, bought it back in August 2005 I think. It's been through quite a bit and was well used for about 3 years at least (before it took too much beating I guess, hehe). One of the cameras I've used the most but also one of the ones I didn't take care of very much either, but then I was young back then..
(I didn't try to clean it first, so its quite dirty, and you can see how much of a beating it's taken). I own that camera since 2005 and I'm still using it! "you could 'paint' on top of a photo using an included stylus"
So Sony had a touch screen in 2005! What happen Sony! Nikon does not like your comment. i had the same question. you are spot on. Same here :) I had to read the entire article after I saw this picture hoping to find out how Sony was able to create shallow DOF through in camera processing in 2005. Disc film! Now that might be worthy of a tbt after we run out of digital cameras. I had one, still do though after a few years as a toddler toy it no longer zooms, that being said still focuses and records files. Slow but effective camera that captured 1000's of images for this family guy. Hated the menu system so much, and bought an RX10iii thinking after all those years they must have made the UI better, not the case, oh well. Just that to date, and again I haven't handled the new A9, or RX100 IV but from my early-mid 90's experience to 2016 RX10III I was underwhelmed by the UI. The unfortunate side is I loved the specs. and still look for the improvements in UI that will make me reach for my wallet. The sad part of this is the technology has come so far that what was once a menu for those wanting to get more out of a camera, and not a necessity. Has become necessary the menu is intrinsic to the performance and capability of getting the IQ and sometimes just setting parameters. Heres to hoping they get it right, or give us more dials and manual control to avoid the menus. Seeing the title and the 'just' 8Mp camera my heart raced ahead: This must be a new hi-end low-noise new sensor, attached to a portable photo album... yay, I need 2 of these for my parents! "In the mid-2000s camera manufacturers had to find ways to differentiate themselves from the competition." But yes, interesting read as Throwback Thursday articles use to be. Didn't even remember this particular camera! Fixed that for you. I hope. I had this camera back in the day and it was probably the best point and shoot I've ever owned. The screen was huge and the battery lasted all day. I had written a 6-part review of this camera back in 2007 on my ancient blog. Clearly inspired by Phil Askey at the time. Remarkably, all the ISO and detail tests are still viewable. The N1 is made mainly out of metal which is cold to the touch. It has a feeling of luxury and exclusivity as soon as you pick it up. However the battery/card door is made out of flimsy plastic. The sides and top are also made of plastic by the way, not that you'd notice. Overall, very good build quality. Mine has a mark on the bottom, the metal is slightly dented, but that's only because of my negligence." Oh stop, I'm getting all misty over here. Well, The Chinatown and sidelit corridor sample photos did bring back fond memories. I was just learning about cameras and photography back then, and reading lots of reviews. Thanks for your efforts back then and now! Am I the only one who thinks that the camera industry has stagnated? There is a distinct lack of creativity. In these Throwback Thursdays I've seen some very innovative designs such as the Olympus and Minolta cameras. 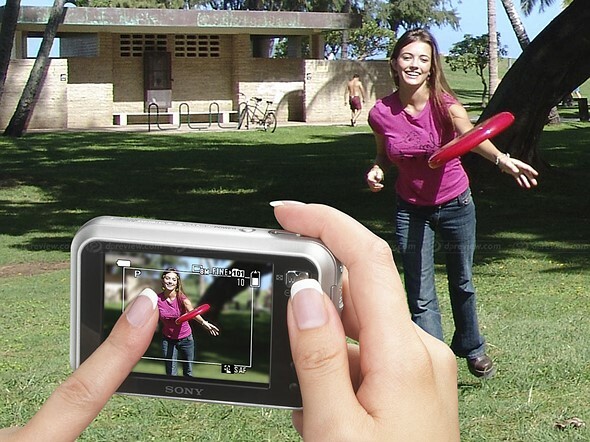 This Sony camera seems to have had a decent touchscreen. Fast forward 12 years and few cameras have a touchscreen and we rarely see innovative body designs. It has stagnated in non-touchscreen controls and body because broadly what we have now works fine, aside from simple changes like finally giving Nikon users the ISO button where it should have been since the D1. I'm amused that Sony has FINALLY put touchscreens on their two newest bodies (a6500 and a9), when they had touchscreens on all the cheap NEX family (non-EVF bodies) years ago. I'm glad Nikon and Canon are including touchscreens on their newest bodies (even the professional-targeted bodies), I like the option, even if I don't always like the execution (X-T20 touchscreen didn't impress me). Of course it has since people bought into the idea a cheap DSLR with a kit lens was the way forward till smartphones came along. It's really astonishing how mature touch screen technology Sony used to have. It's hilarious in this respect, how hard Sony is struggling today with implementing even a semi-decent touch operability on their cameras. What happened with the old brilliant engineers of that department? I am pretty sure that the missing or super-inferior touch screens on Sony cameras are the reason that at least 10 - 20% of the potential buyers (especially youngsters) simply picks another camera from the competition. Or maybe it tells us that Sony really isn't struggling with the implementation at all. Or even trying. They are simply cutting costs. Ehh, I'm not exactly a youngster at 35, and that wasn't the sole reason, but it was one of the turn offs when I was looking at mirrorless systems a few years ago... What's puzzling is the entry level NEX 5 / a5xxx usually had touch (but no EVF) while the higher ones didn't. Meanwhile every M4/3 body has it and it works fine for touch AF, playback zooming, etc. I'm an oldster and i wouldn't touch a cam without a touchscreen - not even touch its shutter button. Would you folks please not forget to headline the title "Throwback Thursday" so we don't have to hunt for it. It's kind of impressive they had all that functionality going several years before the first iPhone (and yes, I know it wasn't the first touch smartphone, far from it), yet somehow it took quite a few more years before things like touch AF were even semi standard on cameras. Sony has today announced the compact and rather unique DSC-N1. This new model features a wide viewing angle three inch touch screen LCD designed to act as both camera control and display. The DSC-N1 records a VGA (640x480) copy of every image you take (up to 500) and stores it internally, these images remain even after the full resolution images have been transferred. This provides a long term 'pocket album' feature which can be browsed in a variety of ways. On the photographic front it features Sony's own eight megapixel 1/1.8" CCD sensor with sensitivity up to ISO 800, this is coupled to a three times optical zoom lens. The DSC-N1 should cost around $499 when it hits the shelves.